Residential property ownership has been heavily supported, some would even say subsidised, over the past 30 years by household debt (mortgages) growing substantially faster than household incomes. 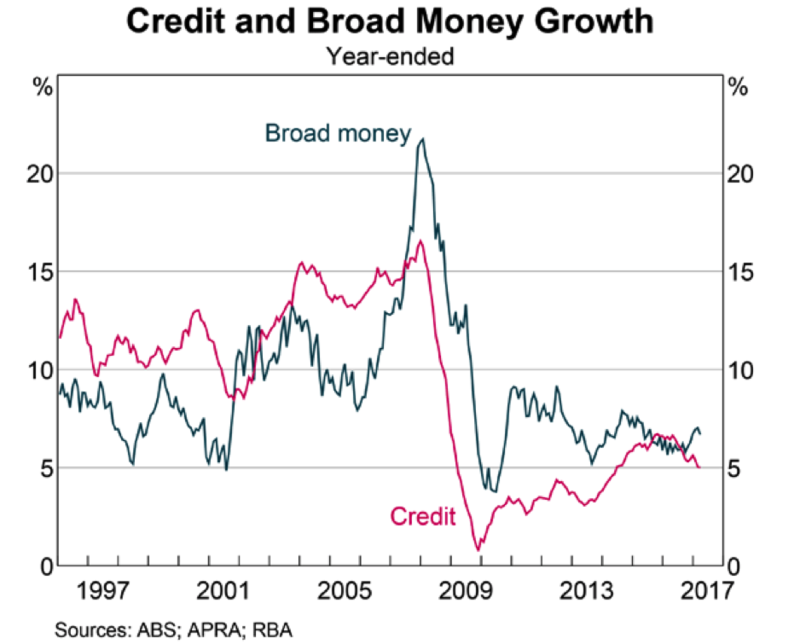 Here are two charts published by the RBA, which illustrate the point. 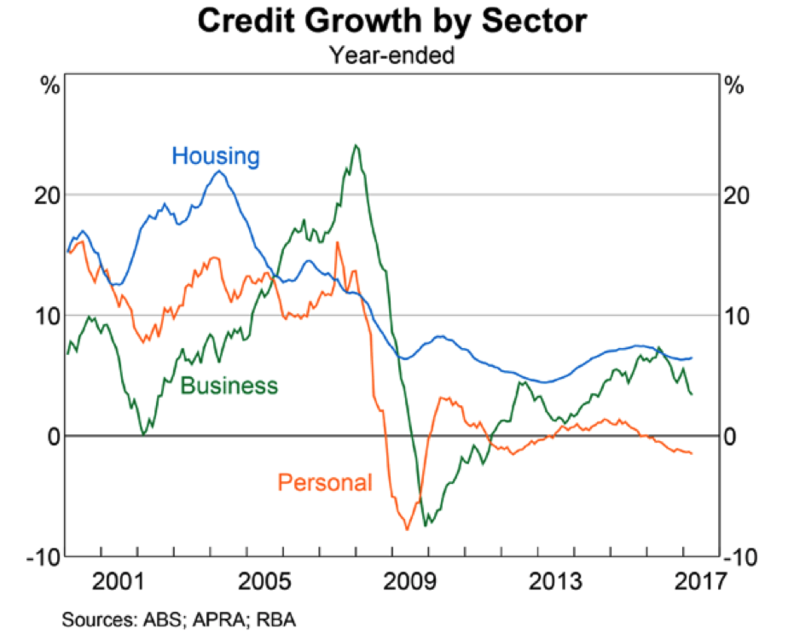 They show growth in credit (debt) in total terms and by sector. It's likely that any major fall in house prices will be preceded by a fall in the availability of loans, leading to a reduction in loan growth, or even a contraction in credit. Keep an eye out for a significant fall in these graphs - or even better, talk to mortgage brokers regularly about what they're seeing in the market. Any major reduction in the availability of loans is likely to be a sign that credit growth is slowing and a decent correction is coming. Market participants should continue to survey changes to lending criteria and mortgage rates over the months ahead. 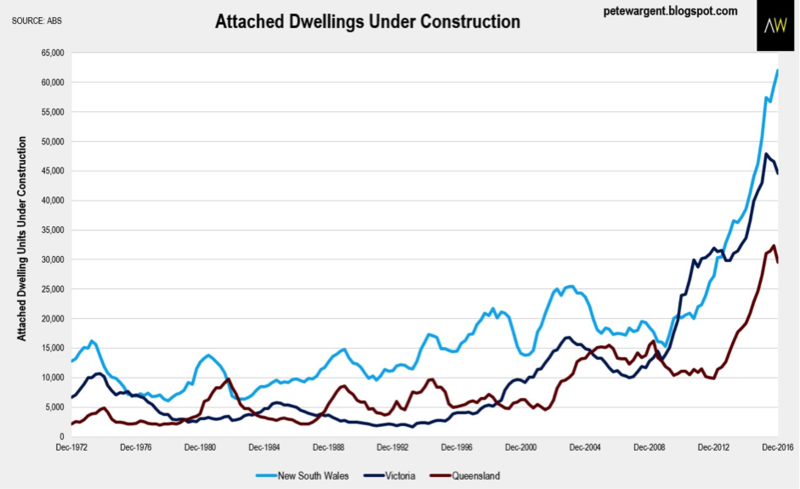 In the property investment sphere, it has been fascinating to note that vacancy rates - reported here as online rental listings advertised for three weeks or more compared to the total number of established rental properties - have remained remarkably tight in Sydney and Melbourne, even at this advanced stage of the construction cycle when record new supply is being delivered. In part this reflects that the rate of net overseas migration into Australia has quietly accelerated to its highest level in four years, with Sydney and Melbourne attracting the bulk of new settlers, while at the same time, record numbers of international students are crowding into these respective inner-city hubs. Apartment vacancy rates will be a trend to watch closely across H2 2017 as developers chew their way through the enormous construction pipeline. 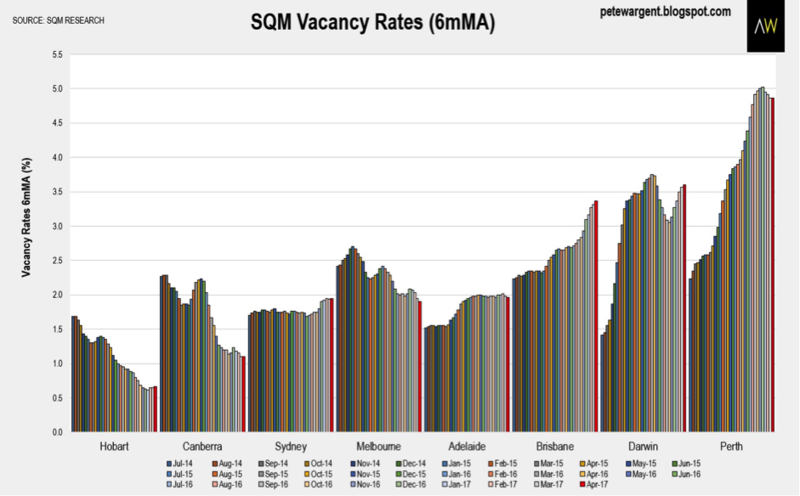 With Melbourne also attracting migrants from interstate, against the odds demand from searing population growth is outpacing supply, in turn forcing vacancy rates to half-decade lows. If vacancy rates in the two most populous capital cities remain contained as the year progresses, then the recent moves to curb investor activity could even result in the return of rental price growth in 2018-19. Brisbane’s median apartment rents are already fading, however, and our on-the-ground experience suggests that declines are likely to continue doing so for some time to come. Keep an eye on the number of developments that look fully built which have signs saying “apartments for sale or lease, starting at just …”; or the lack of stickers emblazoned across development boards stating “sold out in one weekend” or “100% sold”. I’ve been doing a fair bit of driving in the Western Suburbs in the past few weeks, and it’s surprised me how many signs on built apartment blocks are advertising apartments still for sale. Now developers may have been holding stock back to enjoy an ever-rising market, but that’s probably giving benefit of the doubt. One obvious statistic to watch for is unemployment, because quite frankly, right now most of the nation is not struggling to pay their interest on their mortgage or debt. However if you lose your main source of income that’s going to be a different story. Right now not many people feel threatened in their job, however if house prices stagnate we may find that small business owners that were using home equity for business expansion pull back on that strategy, causing marginal employment to dry up and interest or rent to become difficult to collect. However … it doesn’t look like unemployment is going anywhere for now from the forecasts I look at. Read our panelists' first response on the subject of residential property in: "The gamechanger for residential property"